One of our most popular holiday candle sets. Inset into a hinged, textured gift box is a contemporary trio of 3 oz candles- one black, one white and one clear. Candles are hand poured with scented soy wax. One color imprint on each candle and box is included. One scent is included. Many available scents from which to choose. 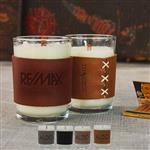 This is a quality custom candle gift set! Dimensions: trio of 3 ounces.